Dit is een heel fijn hostel, echt zoals een hostel bedoeld is! Er is altijd gezelligheid, het is er netjes, maar niet té netjes en het personeel is extreem behulpzaam en kookt fantastisch (zowel ontbijt als de dineravonden zijn een aanrader). 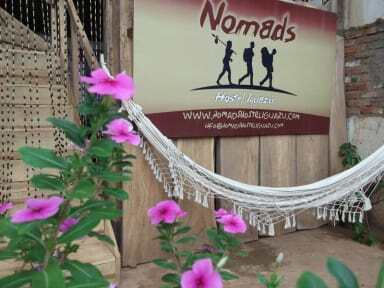 I had a great time at Nomads. The staff was friendly and helped me whenever I had a question. Also it’s really easy to go from there to the bus terminal to go to the falls and it’s right next to some nice restaurants. It was clean and had a nice chill atmosphere. I would definitly recommend it. Fijn hostel! Warm water duurt even maar is er wel! Goed ontbijt. Hostel ligt heel dicht bij de bus terminal. Van het zwembad moet je niks verwachten, is een beetje groen en vies. Beautiful hostel with loads of greenery in the yard. Only downside is it gets really hot, there’s no mosquito nets and aircon barely works. Other than that, fantastic place! Everything you need is there, plus a great atmosphere and great staff! Very nice place to stay for a couple of days if you are visiting the falls. The location of the hostel is perfect, it’s a 5 minute walk to the bus terminal. Great breakfast and good bed! The quality of the showers depends on the room. The garden is really nice with all the green, big citchen and a lot of chill spots. Marcelo, thankyou for all your help you made my stay even better. Would recommend the hostel, you’ll have a nice stay for the money you pay and the location is really good. Good location to get to the bus to the falls. Every day there is a nice breakfast with fresh fruit, bread, coffee and a piece of chocolate cake. The room is clean and there is a big shower. The pool would have been so nice to chill since it was pretty hot. But unfortunatly they don't clean it properly so we didn't swim. After we took a flight to Salta from Iguazu Aiport in Brasil. I can recommend the taxi on the corner of the hostel called 'Remiss La Estrella' they get you there for 550 pesos. Small, nice hostel. Pool was dirty. Friendly staff. Breakfast was the best i had in argentina. Heating didnt work well, so a bit cold at night. Extra sheets helped. 1 locker couldnt get locked, there was no intention to replace it. When i asked to receive and use the door keys to lock the room so all backs would be locked, the staff didnt want that. They preffered us using only the lockers.. that was a bit strange. Good hostel. We just stayed there for the waterfalls, in puerto iguazu is not much to do. A bonus in this hostel is that your breakfast gets served and you do not have to do the dishes.